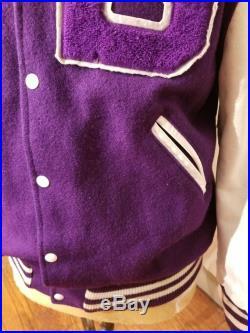 This jacket can be unisex, it's unique purple wool felt is fablous, with white leather sleeves that really pop off eachother. 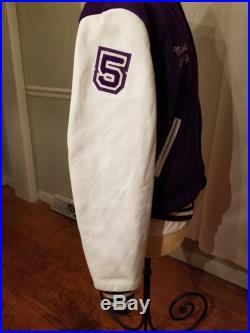 This jacket has a purple strip and white strip knit waistband and cuffs , with a white leather trim on each pocket. 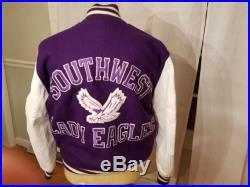 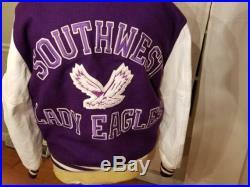 This jacket has a huge eagle patch on the back with school leathers across the back with the eaglethis jacket is lined in a black nylon and has numbers# on each sholder of the sleeves in purple patched over the white leather. 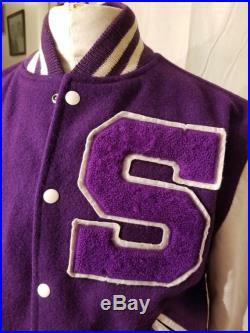 Wear this from a crisp spring night to fall and leyering underneath for deep winter. 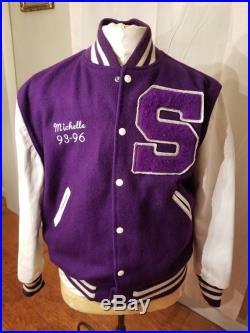 Wear this jacket with jeans to dress pants, from a pull over sweater to a dress shirt, or t-shirt. 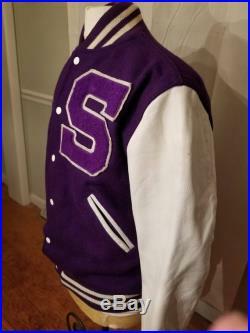 When ever, where ever this jacket will become your favorite''go to'' jacket for anythingmeasurements:two front pockets 6 x 5 inches eachsleeves 25 inches longacross chest / bustline 44 inches wideknit waistband 34-40 inches stretchedshoulder to shoulder 20 inches acrossshoulder to end of jacket 27 inches longsize medium to large.